Windows RG (Really Good Edition) review, with a bit of Windows XP too! Home » Windows RG (Really Good Edition) review, with a bit of Windows XP too! Computers are like air conditioners, they stop working properly as soon as you have Windows open. Ever had those Windows moments when you felt like going and launching a nuke on Bill Gates’ house because of the wonderfully crappy software that Microsoft dishes out? I’m sure most of you Windows users have. Here comes a new edition of Windows, called Windows RG (Really Good Edition) by James Cliffe. Actually, I visited this site after it was featured in BBC World’s tech show, Click. And I must say, I’m not disappointed at all. Try this on a day when you have loads of time, because you’ll need at least half an hour to read the malicious dialog boxes and understand the subtle sarcasm underlying the whole concept. 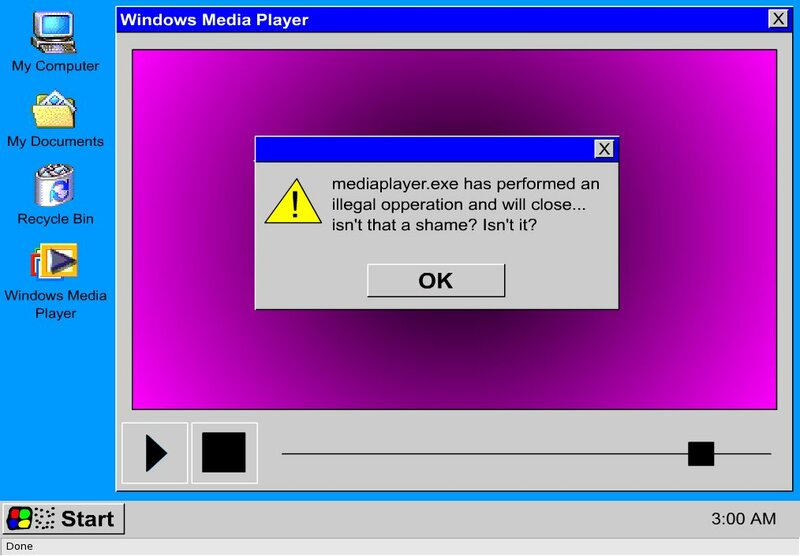 What these guys have done is that they have made a spoof on the popular Windows operating system as a flash-based interactive page, so make sure that you’ve Macromedia Flash Player installed. Then, hop on to this site and enjoy the experience. Don’t get worried by the messages any time, they are just for fun. Interact with them just like you would on your actual thing, you can click the icons, access by Start button, etc. Just don’t blindly go on okaying all the dialog boxes, read them and let the joke sink in. You’ll find that the Windows RG interface is somewhat like Windows 98, but that’s just coincidence, honest. You’ll have Word RG, that will feature that pesky little paperclip who’ll irritate you first, and then you’ll feel sorry for it because it will be murdered. You can also make some ‘glorious artwork’ in Paint RG, if you can launch the application, that is. You have loads other features too, like playing solitaire, ordering food (! ), Windows Update, going online etc., each delightfully non-functional. Then, of course, you can listen to music, and perform some illegal functions along the way. Check your documents, and trash your computer from My Computer. Since a lot of junk has been piling up, why not empty your recycle bin. After you are done with this ‘wonderful operating system’, you can try to shutdown. But as we all know, it develops a slight affection for the user and like a trusted butler, it’ll give you some advice. In the end, you’ll be lucky to complete the shutdown in less than five minutes and be able to view the names of the wonderful guys who created this. With Microsoft, you get only Windows. Open-source software gives you a whole house. I had tasted blood, and wanted more. So I dug up a few potholes in the Web and found an ‘alternative version’ of Windows XP (again, get your flash player out folks). This covers a wider net, and is critical of more products like McAfee, Kazaa, Flash and AOL, all in an interface mimicking the real thing. Although less irritating than Windows RG, it is definitely more sarcastic at times. This one has more options, so be sure to go through everything that’s clickable in the real world, even the system tray and the Control Panel options. It is particularly nasty with Kazaa P2P. Now version doesn’t come with any Office applications, but it makes up for that with an excellent Internet Venturer. The Run command had me rolling on the ground in splits. After you’ve checked this OS out, you can shut it down. Do notice the messages, the laugh riot continues till the end. But before you do so, make sure you read the Credits.txt ‘file’ in My Documents (can only be accessed from the Start button). You can visit the author’s site too, and discover more jokes on Netscape. Till the time we get our hands on Windows Vista (Viruses, Insecurities, Trojans, and Adware) sometime in early 2007, this is one Linux enthusiast saying goodbye to you. ‘Enjoy’ your Windows RG experience. Okay, this one’s for Siddharth Razdan. You wrote about screenshots on your blog a few days ago. Useless trivia, but just telling you that the screenshots for this one were taken with Ksnapshot software.